The Rabbi with a Blog (Rabbi Jason Miller): JTS Chef Joe Landa Wins on Food Network's "Chopped!" JTS Chef Joe Landa Wins on Food Network's "Chopped!" I learned a lot in rabbinical school at the Jewish Theological Seminary. I also managed to eat pretty well too. Right before I began my six-year tenure at the Seminary, a new company took over the food management operations in the cafeteria. From what I understand, Flik Independent Schools Dining took it up a notch. Rich Costas and his team had never run a kosher kitchen before, but they learned quickly how to serve three delicious meals a day and cater fancy events while adhering to the kosher laws. The scrumptious food served at JTS might have been a well kept secret until last night. The Seminary's executive chef Joe Landa was a big winner on the Food Network's cooking competition show "Chopped!" Chef Joe's been establishing his reputation as a creative culinary innovator for almost a quarter century. Before becoming a champion on "Chopped! ", Chef Joe won the 2010 "Whole Grains Council" national recipe contest. He's a certified personal fitness instructor with a passion for healthy living, physical endurance, and balanced nutrition. 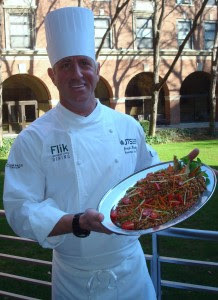 Chef Joe came to JTS in 2003 after many years as a chef at various restaurants in New York City. As executive chef at JTS, Chef Joe helps serve about 600 customers per day. He's responsible for the creative choices in the cafeteria line for three meals a day, plus all the catering requests. In addition to preparing meals for Seminary functions, Chef Joe will also cater weddings, conventions, Shabbat and holiday meals, and other events at the Seminary. On last night's episode of "Chopped! ", host Ted Allen challenged Chef Joe and three other chefs to create a three-course meal by using flour tortillas, English cucumbers, fresh fava beans and pickled beef tongue for the Appetizer round; pork rinds, galangal, purple kohlrabi and rabbit legs and thighs for the Entrée round; and lambe, chickpea flour, Asian pears, rose water syrup for the Dessert round. These were clearly not the typical kosher meals that Chef Joe is used to cooking up at the Seminary. That could be the reason he didn't identify where he works; only stating that he's an executive chef in Manhattan. Chef Joe took home the $10,000 prize beating out the stiff competition made up of a sous chef at NYU Medical Center, a restaurateur in Brooklyn, and a restaurateur from Gramercy Park. While I'm not a foodie or a regular Food Network viewer (this was actually my first time watching anything on the Food Network), I found this show to be exhilarating. I can't wait for the next time I'm in NYC to stop by the Seminary and sample some delicious offerings from Champion Chef Joe Landa. Congratulations Joe... even if it was far from kosher, you made the Seminary proud! "Join our own “Chopped” champion, Chef Joe Landa, for his award winning menu selection as featured on his recent TV appearance on the Food Network. Chef Joe will be making a kosher version of his Chipotle and balsamic glazed pickled beef tongue tostada with ginger fava bean mash and English cucumber salsa. Come down to the JTS Dining Hall on Wednesday, June 29th at lunchtime!" Awesome. Thanks for sharing this! Ok, but did he have to be so obnoxious? And also, it was hilarious when he said 'I learned to cook with fresh herbs while in the south of France'. I mean, really. Don't you have fresh herbs in the US? And what's with the ridiculous bare chested skateboarding intro? He's too old and wrinkly to do that. Just cook, and be humble. The producers cut out all the JTS and Flik references, choosing to focus on his fitness buff persona. The hosts apparently made several jokes about his use of "kosher" bacon--but those never made it on the air. One of my colleagues who was a student with me at JTS sent me a private message asking if I had just "outed" Chef Joe. He thought that all references to Flik and JTS were absent from the show because Joe could get in trouble for cooking treif. This rabbi wrote to me: "I know that if my high end shul caterer (under orthodox hasgachah) ever won a cooking show making pork and it got around, he could lose business and even his kosher certification by mere virtue of maarit ayin. I agree its cool that he won but not everyone might." In my opinion if one is legitimately concerned about a kosher chef or caterer on a food network show cooking treif, then you're just playing into the mishegas (craziness) of the Ultra-Orthodox in the kosher industry. Joe's not Jewish. I hope people don't think that he cooks only kosher at his home to avoid maarit ayin? Anyway, I certainly didn't "out" him because Flik was publicizing his appearance on their blog and twitter feed (@FlikISDining). 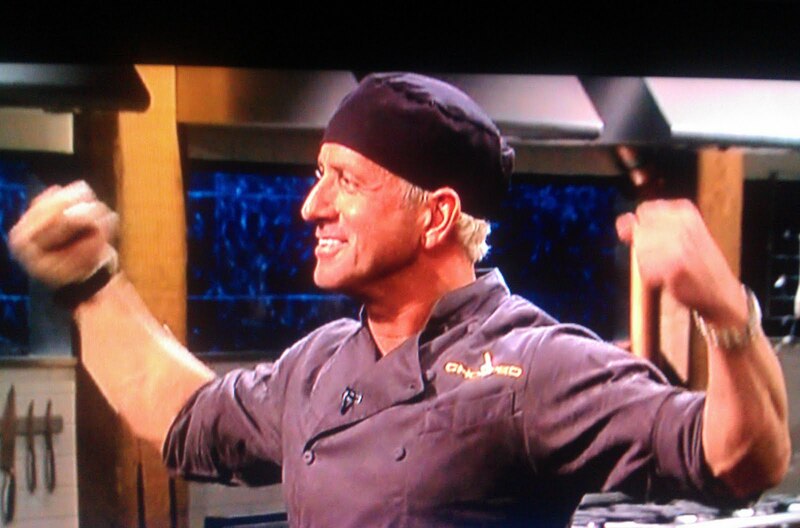 What a great time Joe appeared to have had beating the other "classic trained" chefs on Chopped. I thought he appeared humble and somehow vindicated at the outcome. It's a shame to see comments condemming in any way, his effort and accomplishment. And for the person with the " too old and wrinkly" comment...you should be so lucky to look like that or cook like that! He's hot!!! Thanks Rabbi for your posting and feel free to pass along my contact info to Joe! I would like very much to meet him.